Witness the collapse of the parties that governed Italy throughout the post-war period; the decline of France’s center-right and Socialist parties; and the upheaval among Democrats and Republicans in the U.S.
Well-prepared, experienced leaders are unable to mobilize voters. Established parties — even entire countries — are falling into the hands of charismatics and extremists. Where is this all going? Bolivia? Yes, Bolivia. 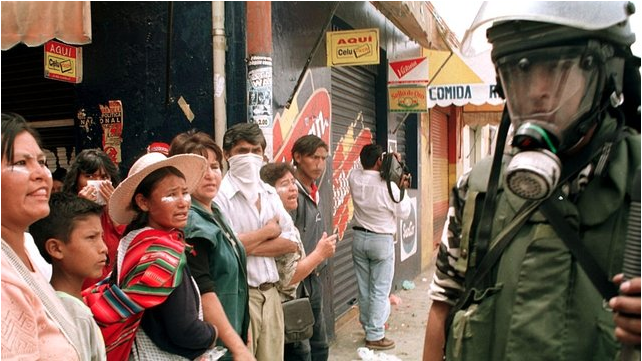 Precisely because it’s one of the poorest countries in the Western Hemisphere, Bolivia’s politics were never as institutionalized nor its parties as strong as those of richer countries. But it has suffered many of the same economic shocks, technological disruptions and social and environmental changes as far more developed countries. Bolivia’s many coups notwithstanding, from 1953 onward, its politics was characterized by parties arrayed along a left-right, labor/peasant-vs.-business/capital axis typical of the 20th century, which was remarkably stable. So dominant was this system that the same parties and individuals survived civil disturbances, guerrilla insurgency, hyperinflation, economic meltdown, striking social change and many coups, returning repeatedly to take up the reins of power. Why did politics suddenly collapse in 2003? Here the conventional wisdom is mistaken. It is simply not credible that a dispute over a gas pipeline to Chile, the old enemy, killed off not just a president and his government but Bolivia’s political parties, party system and the dominant axis of political competition. Political competition over workers vs. capitalists never made sense in a poor country that lacked both. Competing over cultural and ethnic identity made much more sense in a society riven by both. Throughout Europe, parties founded to represent industrial workers cannot hope to win elections, or even retain a purpose, while “workers-as-workers” disappear. This is why the current turmoil in France’s Socialists, U.K.’s Labour, Germany’s Social Democrats and the Netherlands’ Labor is not circumstantial, but existential. But where one group dominates, a new axis may emerge linking this group’s party at one end with a cosmopolitan party that denies, or seeks to minimize, identity differences at the other. We see this in Europe and the U.S. now, as well as in Bolivia. In historical terms, this is an extraordinary reversal. The Enlightenment believed in the equality of mankind. Liberalism — in the classic sense of the word — sought to overcome identity-based cleavages. In countries like the U.S. and France, liberals built not just politics, but national identities based on shared ideals, not skin color or cultural traditions. Parties arrayed on a left-vs-right axis were accessible to everyone, regardless of identity. The danger now for the West is that a new politics is forged around race, religion, ethnicity and language. This could mark the end of the liberal project. Technological and organizational change have a habit of increasing the size of the economic pie, facilitating positive-sum policy options that are mutually beneficial. For example, 19th-century revolutionary pressures faced by many Western countries were allayed by education, health and welfare reforms. The demise of left-right politics, and the rise of identity clashes threatens to alienate us from each other even as it removes the means for finding agreement. It is a sad and dangerous turn for the West that may forever change who we are. Jean-Paul Faguet is professor of the political economy of development at the London School of Economics and co-programme director of the MSc in Development Management.